New Delhi: The Asian Development Bank (ADB) on Tuesday became the first multilateral agency to reduce India’s growth forecast for the current fiscal 2016-17 to 7% from 7.4% estimated earlier in the backdrop of government’s decision to demonetise Rs500 and Rs1,000 currency notes. In its Asian Development Outlook 2016 update, ADB said its lower growth projection for India is due to weak investments, a slowdown in the country’s agriculture sector, and the lack of available cash due to the government’s decision to ban high-denomination banknotes. “This will likely affect largely cash-based sectors in the country including small- and medium-scale businesses," it said. However, it added that the effects of the transition are expected to be short-lived and the Indian economy is expected to grow at 7.8% in 2017. The government announced withdrawing the high-value currencies on 8 November which amounted to 86% of the total value of currency in circulation. The slow pace of supplying the new Rs500 and Rs2,000 banknotes has led to long queues before bank branches and ATMs and hit businesses. 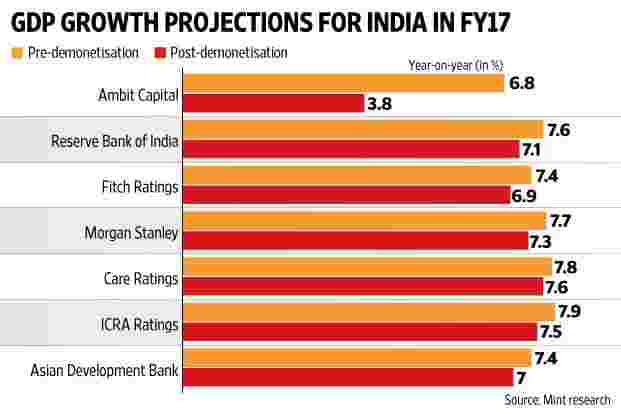 Fitch Ratings has already downgraded India’s growth forecast to 6.9% in 2016-17 from earlier estimate of 7.4% while Morgan Stanley has reduced its projection to 7.3% from 7.6% for the same period. ADB trimmed its growth forecast for south Asia as well as developing Asia as a result of slower growth expectations in Asia’s third largest economy. South Asia’s growth is now projected at 6.6% in 2016 from 6.9% while developing Asia except Japan is expected to grow at 5.6% during the same year, down from 5.7% expected earlier. ADB said growth in the People’s Republic of China (PRC)—the world’s second largest economy—is expected to hit 6.6% this year, driven by strong domestic consumption, solid wage growth, urban job creation, and public infrastructure investment. The forecast for the PRC in 2017 is maintained at 6.4%. “Asian economies continue their robust expansion in the face of global economic uncertainties," said ADB deputy chief economist Juzhong Zhuang in a statement. “Structural reforms to boost productivity, improve investment climate, and support domestic demand can help maintain growth momentum into the future," he added.